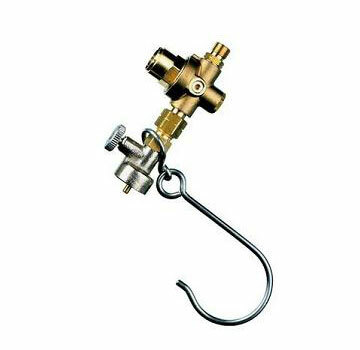 PRODUCT: SIEVERT #3091-33, 28 PSI PRESET LP (PROPANE/BUTANE) GAS REGULATOR, WITH DISPOSABLE CYLINDER (1LB) FITTING AND 9/16-18 LEFT HAND MPT PROPANE HOSE OUTLET FITTING. PRICE/EACH. FITS DIPOSABLE / 1 LB. PROPANE CYLINDER ON INLET. PROPANE HOSE FITTING ON OUTLET (9/16"-18 LH MPT), fits Sievert 1/4 inch ID propane hoses. ENABLES TORCHES ETC TO BE USED WITH DISPOSABLE CYLINDER. HIGH PRESSURE FIXED PRESSURE, PRESET 28 PSI LP GAS REGULATOR -- NOT FOR LOW-PRESSURE EQUIPMENT.